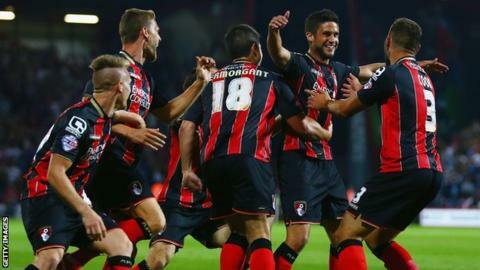 Bournemouth climbed to second in the Championship as they recorded their fifth straight league win. The Cherries went ahead when Gordon Greer nodded a Simon Francis cross past his own keeper, but Brighton hit back swiftly through Adriano Colunga. Marc Pugh acrobatically restored Bournemouth's lead before Sam Baldock netted his first goal for Albion. But Lewis Dunk brought down Callum Wilson and substitute Yann Kermorgant made no mistake from the spot. Defeat means that Brighton are without a win in their last 11 league matches and leaves them sitting just one point above the relegation zone. Sami Hyypia's side threatened to end Bournemouth's run when Teixeira's excellent through ball released Colunga to stroke in the first equaliser. But the Cherries hit back shortly before half-time when Pugh twisted his body to strike a fine volley that took a deflection on its way past debutant keeper Ali Al-Habsi, who signed on a month's loan from Wigan on Friday. Brighton again raised hopes of a crucial point when Baldock latched onto Greer's flick-on from a long kick by Al-Habsi and fired past Artur Boruc. But Eddie Howe's in-form Cherries - who have won their last six games in all competitions, and eight of their last nine - were not to be denied and their pressure told when Wilson's run was halted by Dunk's reckless challenge. "Obviously the thought of promotion excites me but we will not be talking about it. There is a belief we can go on and hopefully keep getting wins but we don't look too far ahead. "It is the toughest game we have had for a long time but the players are in a really good frame of mind and it has been a great few weeks. "You don't expect to go on these types of runs in this league. These are great times for us and we want it to run as long as we can." "We need three points in the table. I am responsible for the results and if we don't get them then something needs to change. "I can't do anything more than my best, I try to do everything I can to coach the team and my team is working very hard. That is the only thing you can do. "It is very difficult to get something from the game if you keep conceding easy goals. I can't blame the effort of the players." Match ends, Bournemouth 3, Brighton and Hove Albion 2. Second Half ends, Bournemouth 3, Brighton and Hove Albion 2. Yann Kermorgant (Bournemouth) is shown the yellow card. João Teixeira (Brighton and Hove Albion) wins a free kick in the defensive half. Attempt missed. Craig Mackail-Smith (Brighton and Hove Albion) right footed shot from the right side of the six yard box is close, but misses to the right. Assisted by Íñigo Calderón with a cross. Charlie Daniels (Bournemouth) is shown the yellow card. Delay in match Tommy Elphick (Bournemouth) because of an injury. Foul by Joe Bennett (Brighton and Hove Albion). Offside, Brighton and Hove Albion. Craig Mackail-Smith tries a through ball, but Íñigo Calderón is caught offside. Goal! Bournemouth 3, Brighton and Hove Albion 2. Yann Kermorgant (Bournemouth) converts the penalty with a right footed shot to the bottom left corner. Penalty conceded by Lewis Dunk (Brighton and Hove Albion) after a foul in the penalty area. Substitution, Brighton and Hove Albion. Craig Mackail-Smith replaces Sam Baldock. Corner, Bournemouth. Conceded by Joe Bennett. Attempt blocked. Marc Pugh (Bournemouth) right footed shot from the centre of the box is blocked. Attempt blocked. Callum Wilson (Bournemouth) right footed shot from the centre of the box is blocked. Assisted by Yann Kermorgant. João Teixeira (Brighton and Hove Albion) is shown the yellow card. Corner, Bournemouth. Conceded by Íñigo Calderón. Attempt missed. Yann Kermorgant (Bournemouth) header from the centre of the box is too high. Assisted by Marc Pugh with a cross.